Originally published under the title "Hezbollah's Horror Weapon and Its Remedy." Hezbollah has more rockets than all 27 NATO allies of the United States combined. The canonical definition of the Yiddish word chutzpah involves a man who murders his parents and then asks for clemency because he is an orphan. An unprecedented degree of chutzpah informs the machinations of radical Muslims, who engineer humanitarian disasters and then demand that the West intervene to save them. In his recent book Mission Failure, Michael Mandelbaum of Johns Hopkins University points to the first instance of this tactic: the Kosovo Liberation Army persuaded Bill Clinton's Secretary of State Madeline Albright to make war on the Serbs by provoking them into killing a hundred or two civilians. Most of Clinton's cabinet didn't want to support the KLA, which made its money in narcotics and human trafficking, and they didn't want to divide the sovereign state of Serbia—a precedent that Russia later used to justify its seizure of the Crimea. Nonetheless the moral blackmail succeeded, and Muslim radicals learned how to push the guilt button of the West. My review essay on Mandelbaum's book appears in the Summer 2016 issue of Claremont Review of Books. Although I find much to disagree with, his reading of the salient events is incisive. His argument intersects with my warning just after the 9/11 attacks that radical Islam intended to horrify the West—not only by committing atrocities against Western civilians, but by causing massive civilian casualties among Muslims. 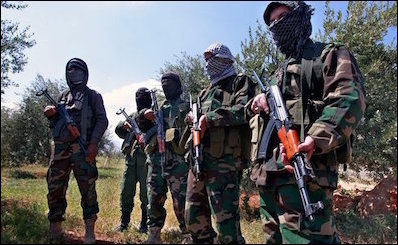 Radical Islamist seek to horrify the West by orchestrating Muslim civilian casualties. To a great extent it has succeeded. The fragile conscience of the Germans could not bear the suffering of Syrian refugees streaming towards its border with the connivance of Turkey. As Giulio Meotti reported for the Gatestone Institute, the refugee invasion will radically alter Europe's demographic balance. Hamas fought the Gaza War in order to maximize civilian casualties among its own population, and thereby entice the West into forcing Israel to withdraw from the West Bank, where short-range rockets could devastate the national airport as well as Tel Aviv. This has not succeeded — yet — because Americans support Israel over the Palestinians by a 4:1 margin. But Palestinian leaders are patient; as the Palestinian journalist Mohammed Daraghmeh wrote (as translated by the Times of Israel), the war with Israel "will end only when the world understands it has a duty to intervene and to draw borders and lines, as it did in Bosnia-Herzegovina, in Kosovo." This macabre pantomime should be transparent, but such is the squeamishness of the West that enlightened opinion shudders at the prospect of more dead Palestinian civilians. The world forgets that the Allies killed 1 million German civilians and between a quarter and half a million Japanese, mostly through aerial bombardments. This sacrifice was justified by the need to destroy wicked governments that killed tens of millions of civilians in Europe and Asia. States have the right to defend themselves against artillery attacks. Israel's right of self-defense is generally acknowledged, but with the caveat the self-defense should be "proportionate," that is, ineffective. It was within Israel's power to take diplomatic, confidence-building initiatives without waiting for reliable Palestinian interlocutors. Unilaterally, she could have ended the illegal settlements in the West Bank. Since she did not do so, her military assaults on Gaza were inapt and therefore disproportionate. Prof. Biggar forgets that Israel's unilateral "confidence-building" withdrawal from Gaza put Hamas rockets on its borders. Logic is beside the point. The West is horrified and wants the horror to stop, and that is just what Hamas counts on. Worse is yet to come. On Israel's northern border, Hezbollah now has 150,000 rockets, by far the largest such inventory in the world, including many precision-guided missiles which can be programmed for evasive flight paths and are more difficult to shoot down with the Iron Dome air defense system, as I warned two years ago. Many of these are emplaced in civilian homes in the Shi'ite towns of southern Lebanon. To destroy them would entail civilian casualties one or two orders of magnitude greater than the collateral damage in Gaza. Knowledgeable Israeli sources report that the Israeli Air Force decided not to make contingency plans to target Hezbollah rocket installations with a high quotient of probable civilian casualties, or those which would bring charges of human rights violations against Israel. After a heated argument among senior officers, the Israelis did include rocket batteries surrounded by human shields in their target list. The fact that they were left out of the targeting procedure to begin with shows how deeply the horror tactic has cut into Israeli self-confidence. For the moment, Hezbollah is bogged down in the Syrian civil war, where it has lost perhaps a third of its front-line fighters, and in no mood for a confrontation with Israel. Nonetheless, a war on Israel's northern border is likely some time during the next several years. Hezbollah's masters in Iran, who provided the munitions and constructed their emplacements, and who man some of the rocket artillery on the ground, probably would begin a war with a limited bombardment—daring Israel to retaliate massively and earn the condemnation of the UN Security Council. Simple military logic dictates that if Hezbollah begins to fire any rockets, the correct thing to do is destroy the inventory. 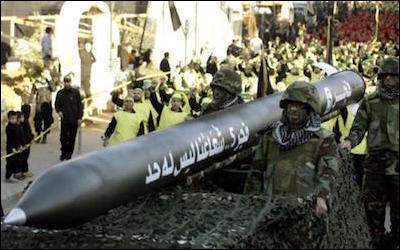 A fraction of Hezbollah's projectiles could shut down the national airport, destroy major refinery and electrical generating facilities, and put the whole population of Israel in bomb shelters. 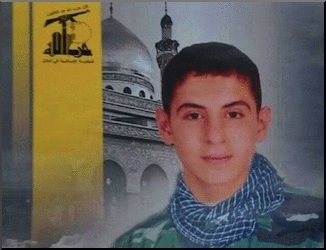 Hezbollah fighters killed in Syria, such as 15-year-old Mashhur Shams al-Din, are eulogized as martyrs by Hezbollah media. Judging by Israel's fumbling over the targeting issue, its leadership seems in a quandary. If Israel were prepared to reduce Hezbollah in the event of war, it would have taken the precautionary step of publicizing its estimates of the likely number of civilian casualties, in order to inoculate world opinion against the eventual need to kill some tens of thousands of civilians. I do not normally offer advice to Israel's Prime Minister Benjamin Netanyahu, but this is not an issue of Israeli defense per se but rather the management of world opinion. He should make public an estimate of the probable number of civilian dead in the event of a war with Hezbollah, but double the number. He could then argue after the fact that he had exercised restraint by killing only half as many as initially estimated. I do not mean this facetiously. The West got used to half a million dead Syrians, and it can get used to the idea of 100,000 dead Lebanese. Hezbollah's vulnerability lies in the fact that it is a militia that lives in the Shi'ite communities of Lebanon rather than an army based far from civilian centers. Iran is prepared to sacrifice Shi'ite life in Lebanon in its own imperial interests, but the Lebanese Shi'ites themselves may not wish to be sacrificed. Lebanese Shi'ites may not wish to be sacrificed en masse by Iran. By spelling out the terrible consequences of war with Israel, Jerusalem would sow fear and doubt among its prospective enemies. The risk, to be sure, is that such an announcement would put arguments in the hands of Western governments (for example France) that want to impose a solution on Israel that ends its control over buffer lands in the West Bank. The reality on the ground, however, is that the Sunni Arab world is in such chaos from the Mediterranean to the Persian Gulf that the prospects of a settlement of any kind are remote. The greater risk in destroying Hezbollah's rocketry at high civilian cost comes from Iran, which would feel honor-bound to retaliate. Iran probably does not yet possess nuclear weapons, so it is in Israel's interest to finish its business in the north before it acquires them. Iran is unlikely to start a nuclear war with Israel because its leaders wake up one morning feeling apocalyptic. The danger, rather, comes from the possible escalation of what would begin as a conventional exchange. Former Iranian President Akbar Hashemi Rafsanjani (a supposed moderate) famously called Israel a "one-bomb country," claiming that Iran could survive a nuclear exchange that would wipe Israel off the map. In fact, it would not be technologically challenging to eliminate all mammalian life in Iran through a combination of nuclear blasts, EMP attacks on the electrical system, delivery of "dirty bombs" into water supplies, and so forth. That is not the sort of thing that governments should go bragging about, but in Mr. Netanyahu's position, I would arrange for an obscure but respected think tank to publish a report on the subject in the style of the late Herman Kahn. David P. Goldman is a senior fellow at the London Center for Policy Research and the Wax Family Fellow at the Middle East Forum.